Back To The Future: Orchestra of Opera North – Live Review. Leeds Millennium Square, August 2017. Steve indulges an 80's film love outdoor in Leeds. 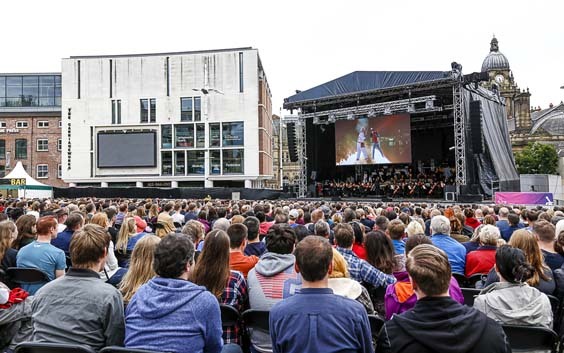 Leeds City Council have organised what promises to be an exciting and popular series of live events and film screenings here in Millennium Square over the summer. This afternoon we’re here to watch a screening of the 1985 classic (and my favourite ever film) Back To The Future on a giant screen, whilst the Orchestra of Opera North perform the soundtrack to the movie live. Unsurprisingly, the event is a near sell-out, but there is lots of room and space for people to make their way around the venue. And although our seats aren’t clearly signposted, there’s an abundance of stewards on hand to quickly and comfortably see that everyone finds where they’re supposed to sit. The film? Well, if you’ve never seen it, it crosses the comedy and sci-fi genre, and tells the tale of Marty McFly (Michael J. Fox) who finds himself going back in time to 1955 by accident, in a time machine that his friend Doc Brown (Christopher Lloyd) invented. He desperately needs to get back to 1985 before he changes the course of history; but things aren’t that straight forward – especially when his very being there puts his parents meeting for the very first time at risk, and therefore puts threat to his very existence. to start, and they sound incredible. They will play the score by Alan Silvestri in synchronisation with the film, and if that intro is anything to go by, we’re in for a treat. My friend is also a big Back To The Future fan, and it seems that’s the case with the majority of the audience. In a film that carries humour, emotion and edge-of-seat excitement, there are bits and pieces that you’re waiting to see and hear. And when a few hundred of you are laughing in the same places and cheering in unison when George McFly stands up to Biff and finally becomes Lorraine’s density… I mean destiny, then you know you’re in good company. The excitement, action and comedy that Back To The Future brings you is emitted perfectly from the stage, and the orchestra handle outstandingly the entire score of the film. My friend and I even joke that we think they’re miming! Throughout the film we’re forgetting that they are there, even though they’re giving us a powerful sound, crisp and clear sound. There are three parts to the Back To The Future story, so you either know if Marty got back home in time and did a good job, or you need to find out. But by 7:30pm, the orchestra receive a standing ovation for their work once the film ends, and it’s been such a great two and a half hours. There’s a lot of Back to the Future fans, young and old who have had a terrific time. It’s a really good set up here, and it promises to be a fantastic summer in Millennium Square if this show is anything to go by.